Event: Union Square: Not for Sale – Rally Thursday, June 5th 5 P.M.
Bloomberg and his cronies have a vision of New York City where parks are for-profit, people are squeezed out of public spaces, and free assembly is made impossible. Their plans to privatize Union Square Park were “approved” through a rigged process that steam-rolled widespread opposition. But the privatizers have over-reached. They tried to sidestep the law and a judge said “Wait a Second!” Now it is OUR time to BLOW THE LID OFF this scam and PUSH BACK THE PRIVATIZERS! On June 5th, at 5:00 p.m., the Union Square Partnership (the schemers behind the scam) will hold their annual back-slapping, self-congratulation dinner, just a block or two off the park. We will gather at the Northwest corner for a raucous rally and celebration of FREELY ASSEMBLED PEOPLE IN PUBLIC SPACE! Expect marching bands, a “Heroes of Union Square Walking Tour,” community visioning sessions, and soapbox preaching. Expect surprises and spectacles and a glimpse of what the city CAN be! Come out and meet your neighbors in the square and defend the public’s right to public space! Today’s New York Times features an Op-Ed by NYC Comptroller William Thompson Jr. and Robert Kennedy Jr. calling for the preservation of Ridgewood Reservoir on the Brooklyn-Queens border, “a teeming wildlife preserve,” 20 acres of which the Parks Department wants to cover over with ball fields (artificial turf, no less). It’s yet another example of the New York City Parks Department’s astounding and caustic attitude against preserving natural and wildlife habitat in our city. The writers state that “this plan flies in the face of Mayor Michael Bloomberg‘s widely hailed environmental blueprint, which bemoans the loss of the city’s natural areas.” Really? I guess they are not familiar with what happened at Yankee Stadium, for starters, where two parks were sacrificed in the Bronx by the Bloomberg Administration. And, I’ve previously outlined the tree destruction that’s occurred at parks across our city. Ridgewood Reservoir was built in 1858 to provide drinking water to the city of Brooklyn. It wasn’t until the end of the century that Brooklyn merged with the City of Greater New York and then gained access to its water supply system. It was abandoned entirely in 1989 at which point nature took over. Ridgewood Reservoir on the Brooklyn-Queens border is an oasis where an amazing range of plant and animal species thrive in a verdant landscape of steep hills and narrow valleys amid the city’s paved sidewalks. But what’s more astounding, the city’s Parks Department could wind up destroying it. As the 50 acres reverted to wetlands, meadows and forests, tens of thousands of plants and trees took root and flourished. Turtles, fish, frogs and millions of insects moved in. Songbirds nested in the glades, transforming the area into a migratory rest stop. 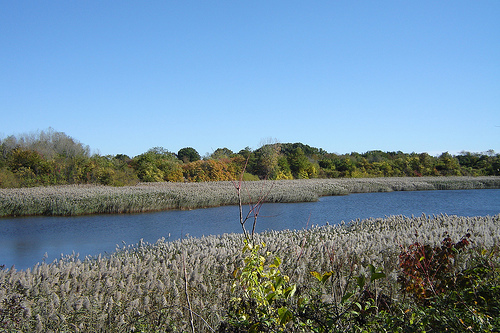 According to the National Audubon Society, 137 species of birds use the reservoir, including eight rare species. It is a place as close to unspoiled nature as you’re likely to find anywhere within city limits. Yet, the New York City Parks Department is considering a $50 million “renovation” project that would cover more than 20 acres of the reservoir with athletic fields and facilities. Our friends at Save Ridgewood Reservoir led a tour of this spot earlier this month with 70 people and 10 elected officials attending, all stunned at the beauty of this spot and the audacity of the Parks Department to want to pave it over. Let’s hope – and help spread the word – that they don’t accomplish their goal. Friday, May 30th; 6:30 p.m.
Urban parks are becoming our newest endangered species. 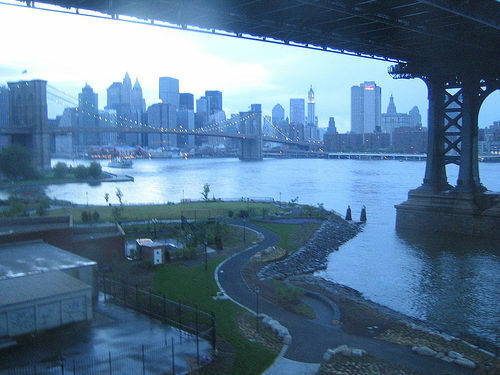 It has been a 20-year effort by the surrounding community to secure the Brooklyn Bridge Park in an 85-acre strip along 1.5 miles of Brooklyn’s East River waterfront. Yet, it has become an example of the implementation of “parks that pay for themselves,” increased privatization and the further demise of public parks. Requiring parks to pay their own way is an extension of the relentless cutbacks in public funding for NYC parks in recent decades, from 1.5% of the municipal budget in former years to only 0.4% currently. 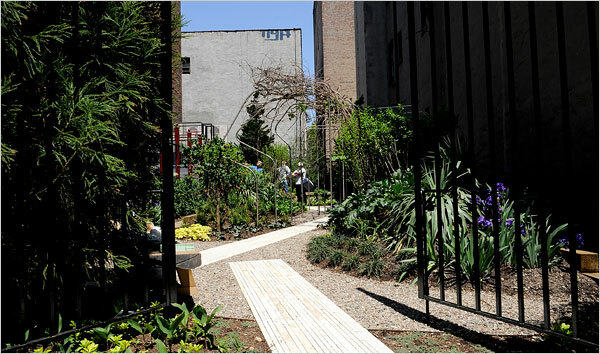 Unlike traditional New York City parks, which are administered by the NYC Dept. 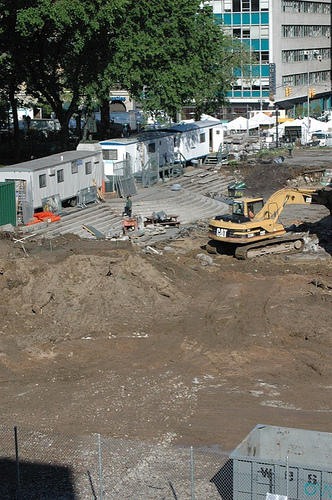 of Parks & Recreation, the Brooklyn Bridge Park is being created by a subsidiary of the Empire State Development Corp., a state agency whose primary mission is promotion of economic activity. Apart from $150 million committed by the city and state for construction, the park will have to generate enough income to pay for ongoing operation and upkeep. The main source, under the approved plan, will be payments from owners of apartments in high-rise housing with 1,200 luxury units that private developers will be allowed to build within the park – a massive intrusion into its narrow swath of green space. Free and open to the public. Wine, cheese and snacks will be served. Presented by the Sierra Club. 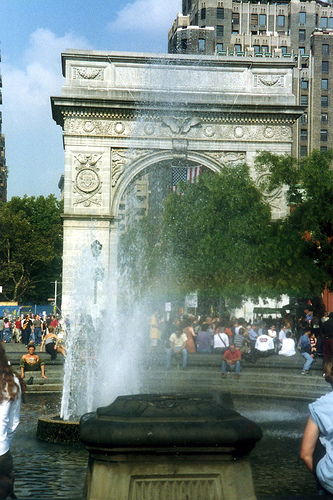 The footage shows the government’s bait-and-switch games with the outraged community, whose members watch the City attempt to transform the Washington Square Park that they know and love into one that is pretty and pacified and far from its artistic, bohemian roots. 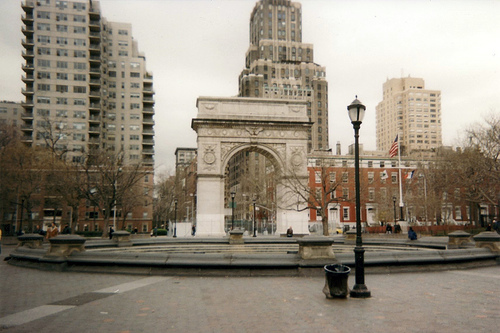 If you’ve been wondering how it got to this – with much of Washington Square Park behind gates and bulldozed – “SQUARE: Straightening Out Washington Square Park“ will bring into sharp focus what’s happened thus far and what’s in store. This is the premiere screening of this documentary. The photo to the left illustrates the luscious trees that existed at Union Square Park just a week ago. The photo below portrays the area as it looks now. NYC Parks Commissioner Adrian Benepe has issued strong statements in the past about “serial tree killers” in our city who destroy trees for no reason and how it is a crime with a $5,000 fine. But I’d have to say that he ranks up there as one. The tree destruction under his Parks Department, at the direction of Mayor Bloomberg, often in the interest of privatization, is outrageous and criminal. What’s important to be aware of is that the Parks Department plays public relations word games in dealing with communities. They’ll state… but look we’re going to increase the playground to THREE TIMES the size! First, did the playground really need to be tripled? Would doubled have worked if it meant saving these mature, healthy trees that are integral to the park? Also, it’s important to be aware that this redesign plan is being put forth by the local Business Improvement District, Union Square Partnership, with influential restauranteur Danny Meyer as co-chair. There is a decrease in the public space for free speech, for the GreenMarket, for the artists, for everyone to utilize. And don’t be surprised if the restaurant idea for the historic Pavilion creeps back into the picture now that they are working on a fresh canvas. Next up amongst Parks Commissioner Benepe’s standard responses is … but we’re planting MORE trees! As if most of us will be alive in 80 years to see the new baby saplings reach the magnificence of the ones they’ve destroyed. We live in an urban environment. Much has been discussed about the importance of trees. Parks Commissioner Benepe and CEO Mayor Michael Bloomberg are businessmen through and through. Neither one of them should be in charge of our city’s trees. But perhaps what I find most offensive is that they get a free pass on this and the media spouts back their p.r. about “MillionTreesNYC” so that is all that most people know about. Read this too: “Crimes Against Nature: The NYC Parks Department” for further background. This amazing tree, a Siberian Elm, was cut down at Union Square Park last week. I would say that this tree was most likely between 80 and 100 years old. It would seem fitting that the media, which is always capturing Mayor Bloomberg and NYC Parks Commissioner Adrian Benepe at their “tree-planting” photo ops, would capture the sadness – and the reality – that is embodied in this shot. 14 trees are being axed at Union Square Park. 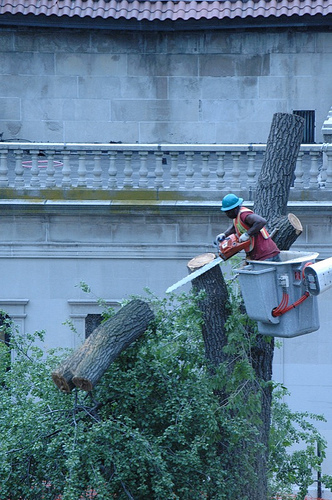 14 trees have been chain sawed at Washington Square Park – thus far. (In both instances, just because they were in the way of their grand and unnecessary redesign plans.) I’ve documented the tree destruction under Mayor Bloomberg that has occurred throughout our city’s parks. When will the New York City Parks Department start treating the trees in our urban environment with the respect and care they deserve? The trees are part of these parks – their history and environment. They are not just expendable. I will run additional photos to show just how barren Union Square Park looks now tomorrow. Thank you to Jessica Alfieri for documenting what’s been going on there. Today’s New York Times has an article by Timothy Williams which covers the delay and increase in cost in rebuilding parkland that was sacrificed for the Yankees’ new stadium in the Bronx. The Bronx lost part of John Mullaly Park (18.5 acres) and ALL of Macombs Dam Park(28.4 acres). Yes. ALL. of. this. park. (and part of another) was given away in the Bronx so that the Yankees, a private corporation, could build their new stadium there. It tells you something about the climate in our city under CEO Mayor Bloomberg that this idea was initiated – and achieved. As the article notes, “The stadium is being financed by the Yankees with city subsidies, while the eight new parks for the South Bronx, which range in size from .24 acre to 8.9 acres, are being paid for by the city.” (We give away 2 parks to a private corporation and the City pays to rebuild them.) The cost is now projected to be $174 million; the original estimate was $95.5 million. The original parks housed tennis and basketball courts, a running track, baseball and soccer fields as well as 400 trees – all eliminated for the Yankees Corporation. Yankee Stadium is scheduled to open on time in April 2009. The parks, which were supposed to be up and accessible at the same time, will not be ready for close to a year later. NYC Parks Commissioner Adrian Benepe was not available for comment for the Times’ article. N.Y. Dosas, Washington Square Park‘s much acclaimed vegan food cart stationed on the south side, returned on May 15th to the Park after a four month break! However, a poster wrote in on Thursday, May 22nd saying he came in search of the famous dosas (vegetarian crepes from South India) with no success – no cart in sight. And today, at the Park, no sign again of N.Y. Dosas. I don’t know how the food cart permits are regulated but I would think they are rather competitive. It seems a bit odd that someone could take a four month break and return to the same spot and then have irregular hours. N.Y. Dosas’ Thiru Kumar won an award last year for best food cart (something called The Vendys). He was there last Sunday, fittingly, for the Veggie Pride Parade. Hopefully, he’ll return soon.